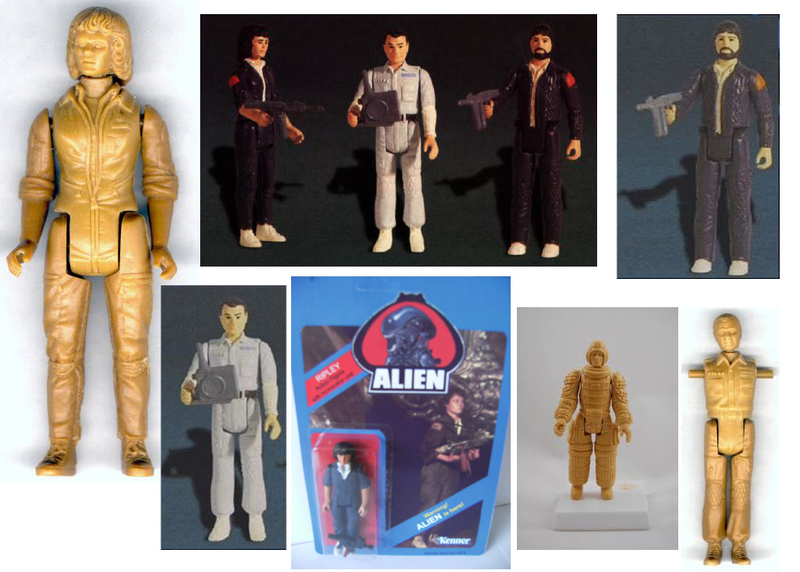 One Good Thing to Come Out of ‘Prometheus’ – Vintage ‘Alien’ Action Figures! As some of you may have gathered by now, I didn’t particularly care much for Ridley Scott’s misguided ‘Alien’ prequel, ‘Prometheus’. I thought it was terrible. We’ve already had this argument. However, as much as I may wish the movie hadn’t been made, the renewed interest it has brought to the ‘Alien’ franchise has resulted in one extremely cool development – the resurrection of a line of canceled action figures from the original film. Back in 1979, the toymakers at Kenner secured the license to produce a line of action figures based on the movie ‘Alien’. The plan was to make them 3 3/4″ scale, just like Kenner’s hugely successful ‘Star Wars’ toys. Unfortunately, at some point prior to release, somebody realized that ‘Alien’ was an R-rated horror movie unsuitable for children. Thus, the whole toy line was scrapped. For years, some photos of prototype figures that circulated in collectors’ magazines left fans dreaming of what could have been. But wait! Now, it looks like those abandoned toys may see life after all! As announced at Comic-Con this week, retro toy company Super7 has obtained the original Kenner prototype molds and plans to release them on vintage-looking card art next year. In 1979, prototypes for 3 ¾” action figures for the ALIEN film were developed but never manufactured. Through our network of industry and collector contacts, Super7 has unearthed the original 33-year-old prototypes and will utilize these to help make these “lost toys” a reality. With official authorization from 20th Century Fox, Super7 will produce the full series of ALIEN toys as part of our REACTION Figure Series (Retro-Action.) REACTION Figures are stylized exactly as items from the “golden age” of action figures with approximately five points of articulation, accessories, and period-authentic blister card packaging. The original line up of 3 ¾” action figures for the ALIEN were scheduled to be RIPLEY, ASH, DALLAS, KANE in NOSTROMO SUIT, and the BIG CHAP (the nickname used on-set for the ALIEN creature). 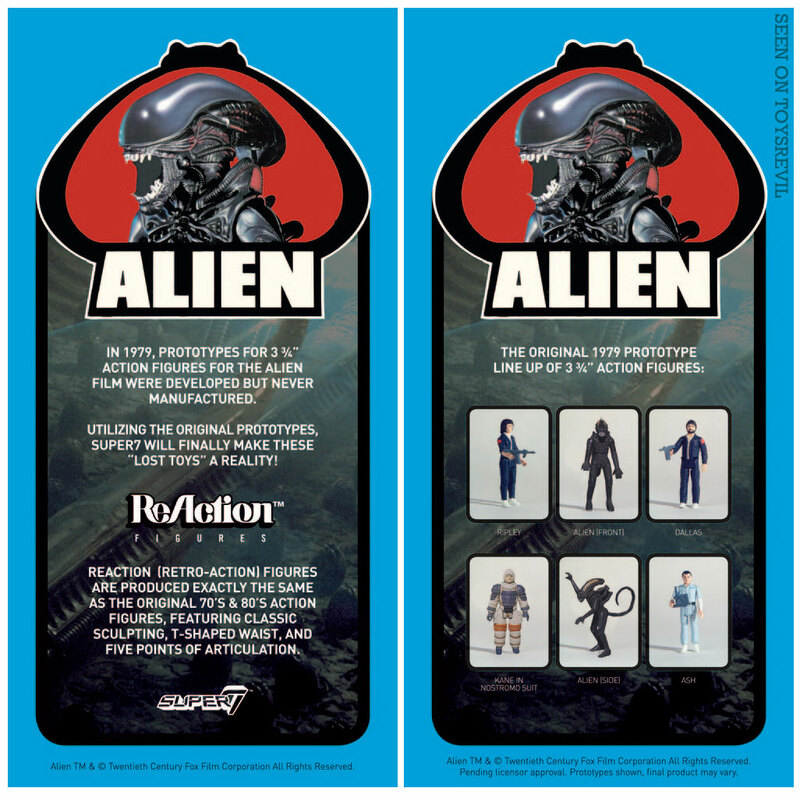 Other ALIEN & ALIENS merchandise will follow, including Designer Vinyl Figures and retro-styled Glassware! Please visit Super7’s booth (#4729) at the San Diego Comic Con for teasers of what is to come in 2013! Yes, please. I would like to place my order the very second these become available. Thank you. Funny! I tried to type “awesome”, but I too was stopped in my attempt. I didn’t actually attempt a single-word response, since I knew it would have been rejected. Alas, the system demands prolixity even when, as the Vicomte de Valmont wrote to the Marquise de Mertreuil when demanding to know whether they were to be at peace as lovers or at war as enemies, “deux mots suffisent” (“two words [will] suffice”). Of course, the Marquise, not one to cling to brevity, wrote back with four words: “Hé bien ! la guerre” (“Very well: war”). Still, those who appreciate economy should note that in the French language, one egg is always un œuf. Super7 needs to make the ‘My Dinner with Andre’ action figures. Please keep us informed when an order can be placed. I will open my wallet wide. Were there ever Tron figures in 1982? Or are they all “new, made to look like they come from that decade”?